It’s a sign of things to come in Web conferencing, as WebRTC is becoming increasingly integrated into the fabric of many businesses’ communications strategies. You can, therefore, expect many other Web conferencing companies to follow suit and begin to roll out WebRTC solutions. In fact, as we discussed in a recent blog post, at least 60 percent of the Internet population is expected to be using WebRTC by as soon as 2019. The technology, therefore, has the potential to emerge as one of the biggest disruptors the telecommunications industry has seen in years. When push comes to shove, however, will significant WebRTC adoption be a positive disruptor—or a negative disruption? There is reason to believe that the latter scenario could be the case. Despite its inherent benefits, like the fact that it can integrate with VoIP systems and it’s free to use, WebRTC could pose many security risks for businesses. And it doesn’t come with guaranteed performance either (more on that below). Before we delve into some of these issues, however, let’s take a step back and break WebRTC down to its basic elements. What exactly is WebRTC? An end user will relay a request from his or her desktop or mobile browser through a third-party WebRTC service provider’s server to another end user also operating on an Internet browser. After receiving the request, the browser will be used to route a response back through the third-party server, which will transmit the response back to the original end user. Once a connection is established, the two servers can exchange video, voice or streaming multimedia in real time. What makes WebRTC so interesting is that it is capable of facilitating a peer-to-peer communication without having to use any external plug-ins. Instead, it uses a combination of several protocols and standards like SIP, JSEP and NAT. On the surface, WebRTC sounds great (more of its benefits include being device-agnostic and supporting high-quality video transmissions). Look deeper, however, and you’ll see there are many underlying risks that come with using the technology. What could possibly go wrong while embedding a conferencing client directly into a Web browser? First, there are some basic security concerns to consider. Using WebRTC is risky in and of itself because it involves establishing a direct connection with another browser over the Web. To facilitate this interaction, WebRTC’s application programming interfaces (APIs) must access a variety of sensitive end-user tools. GetUserMedia, for instance, is an API that is used to allow access to a computer’s microphone, camera and screen. These are not tools you want falling into the wrong hands. Further, there is the threat that the website you are communicating with could locate and expose your business’s local and public IP addresses, and then be able to track your activity and record sensitive information. Security risks aside, there are also basic inconveniences to take into account. While WebRTC is designed to bypass security plug-ins and is device-agnostic, it’s not browser-agnostic. To use the technology, end users must be running on browser platforms that accept WebRTC communication and, right now, that excludes both Apple and Microsoft. Consequently, if your business embraces WebRTC as its core enterprise communications strategy, you may be unable to conference with certain users. An end user may have to install a supported Web browser in order to engage in Web conferencing with you—which would be highly inconvenient. Further, since it’s an open source technology, there is no go-to support center to turn to for advice when integrating WebRTC with your website; developers must rely on a product that is continuously under development and, thus, prone to bugs and security vulnerabilities. Web developers integrating WebRTC must be on the lookout continuously for new software patches to ensure they are running the latest version of the software. These versions will not be provided to you, and failure to integrate them could lead to costly errors, as hackers could gain entry into your lapsed website. If you’re looking for a way to engage in voice and video communication without having to rely on third-party plug-ins, there’s an easier and safer way than investing in WebRTC technology. Look instead into the services of a traditional Web conferencing provider like Onstream Meetings. A private, hosted platform: One of the best parts about using a Web conferencing platform like Onstream Meetings is that end users will have to enter authorization information before logging in and exchanging information. This can help reduce the likelihood of unauthorized users gaining access to an account and using someone else’s credentials to obtain information. Increased security: Onstream Meetings uses advanced security protocols like full encryption so that all information is protected when being transmitted over the open Web. This way, in the event an unauthorized user does gain access, he or she will not be able to access the data in any way. Browser-agnostic conferencing: End users can log in without having to install any complicated third-party plug-ins or special browsers. It can work on any device or Internet platform. Keep in mind that WebRTC is still a technology in its nascent stage, meaning it’s not mature or necessarily in its final incarnation. A safer and more reliable method of enterprise communications can be found using a trusted third-party Web conferencing solution like Onstream Meetings. 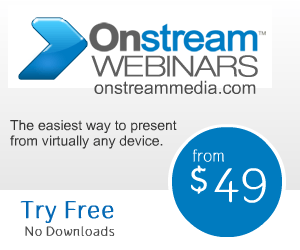 Are you looking for more information about how Onstream can help you business communicate? Click here for more information.